I once had a patient who was an extremely popular university professor. His popularity had little to do with the subject he taught or the way he delivered it. It had everything to do with what he said and did at the end of each class. That's when he announced to his students, "Everyone needs at least three hugs a day. Is there anyone here who wants one now?" His students lined up to get his hugs. They didn't know it, but this professor was helping to keep his students healthy. The hugs did more than make them feel good. Hugs protected them from stress-associated illnesses. A new study from Carnegie Mellon University found that hugs do really protect people who are under stress from getting sick. And if they do get sick, their symptoms tend to be mild. "We know that people experiencing ongoing conflicts with others are less able to fight off cold viruses," said Sheldon Leonard, head researcher of this study. He went on to explain that people who have social support get some protection from the effects of stress, like depression and anxiety. For this study, over 400 healthy adults completed a questionnaire that evaluated their perceived social support, as well as the frequency of conflicts they had with others. Then they received hugs on 14 consecutive evenings. These study participants were then exposed to a cold virus and watched to see whether or not they became ill. 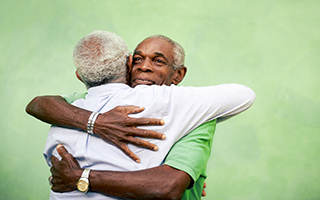 Some did, but the participants who received more frequent hugs and had increased social support had fewer symptoms. In fact, hugs were responsible for one-third of the protective effect of their social support. Frequent hugs had a protective effect among those who were infected whether or not they were stressed. So, hugs work well to reduce stress and keep us healthy. But who is it we should hug? We tend to hug people we like and trust. Not everyone is hug-able. Nor do we want hugs from everyone. But hugging and receiving hugs from a friend or family member could explain why we feel at least some support and protection against infection. One advantage of this approach is that — unlike with apples — you never run out of hugs. Carnegie Mellon University. "Hugs help protect against stress, infection, say researchers." ScienceDaily, 17 December 2014.